In December 2014, The Mayor of London, Boris Johnson, unveiled the testing facility for the new fleet of Crossrail trains during a visit to Bombardier's factory in Derby. 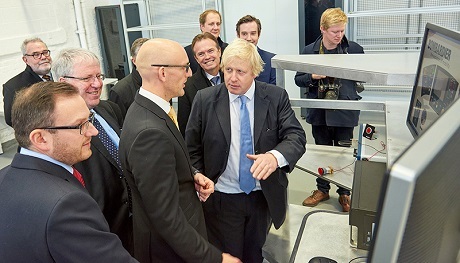 The Mayor opened the new £1.6 million 'iron bird' integration test facility, inspired by the aviation industry, where advanced pre-production testing takes place in a simulated environment. This state-of-the-art facility, christened Train Zero was developed by Bombardier with Frazer-Nash providing cross-sector engineering and systems support. Train Zero will help make the next generation of rolling stock safer, more reliable and improve performance, providing rail passengers with a significantly improved service. Frazer-Nash is respected for its work in high risk, complex industries, where reliability, safety and technical expertise is critical. Our understanding of the rail industry, coupled with our experience in the aerospace, automotive and civil nuclear sectors has added a unique perspective to the Train Zero project. Securing the Crossrail contract has enabled Bombardier to invest in this cutting-edge technology in order to put the new fleet of trains through their paces. It is the first time that such equipment has been used to test trains in the UK . Joined by Transport Secretary Patrick McLoughlin, the Mayor met the engineers, train builders and apprentices who will be building the new trains for the major new TfL-run rail line. The Mayor of London, Boris Johnson, said: "These huge metal machines, which are being lovingly put together by the engineers and train builders of Derby , will soon be whizzing across the heart of London, helping to keep the capital moving. In turn, London is supporting hundreds of jobs and apprenticeships in Derby, evidence that investing in the capital's infrastructure supports jobs right across the country. This magnificent factory, with its Victorian foundations and state-of-the-art facilities, is proof that the UK 's train-building industry is alive and well." Transport Secretary, Patrick McLoughlin, said: "This wonderful testing facility will ensure passengers can enjoy the highest possible standards on Crossrail trains. It is also great to see how the project is boosting the economy here in Derbyshire, thanks to the investment Bombardier has made. A significant portion of the rolling stock on Britain's rail network is British built Bombardier stock. Whether it is Crossrail, the recent Gatwick Express or the Southern route orders, these British built trains will set new standards and boost infrastructure to support our long-term economic plan."